Outlander finds new depths in surprising reunions as Season 4 continues its promising start. This contains spoilers for Outlander Season 4. Not caught up? Read our spoiler-free review of Season 4’s opening episodes – or find out how to watch it online in the UK. Separation and reunion. Those are the cornerstones upon which Outlander is based, even more so than the standing stones in Inverness that catapulted Claire (Caitriona Balfe) through time all those seasons ago. Season 4 has enjoyed something of a return to form, after an uneven Season 3, and that’s partly because it’s rooted in Claire and Jamie (Sam Heughan) sticking together, rather than being held apart, as they brace themselves for a new world in America and try to build a home. That new home, it turns out, will be Fraser’s Ridge, on land offered to the couple by Governor Tryon. “Savagery can exist in many forms, I’ve witnessed it in prince and pauper,” Jamie notes wisely to the snooty Governor, who takes the signing of their agreement as a chance to lord it up and talk about the need to keep savages in line and paying taxes. Just in case you thought that Jamie and Claire were going to settle into a colonial society without any problems. But, of course, a bunch of problems are already heading their way – a fact that’s confirmed by the delightfully corny montage of the couple making home, which is only begging for something to go wrong. There’s Claire practising to shoot intruders (this is America) and there’s Jamie sawing wood in slow-motion, because the programme’s makers know exactly what their audience want. And, of course, no sooner can you swoon over their domestic duties being put in order than the neighbours rock up – and, if the skull from Episode 3 didn’t set alarm bells ringing, the Cherokee soldiers looking threatening on their doorstep certainly do. Oh, and there’s the small matter of a bear on the loose too. Jamie drags said “bear” to the Cherokee, who reveal that the man/bear was an exile from the tribe for committing sexual assault, and that he then began to haunt them and people in the surrounding area. With a bearskin and claws, as you do. By vanquishing this terror, Jamie earns the honorary title Bear Killer. Claire, meanwhile, bonds with Adawehi, the tribe’s healer in a sweet sequence that relies on hand gestures rather than words; on the one hand, Claire asks if she has children, on the other hand, Adawehi tells Claire about a dream involving a bird swallowing the moon and laying an egg on her hand, plus something about death. Your standard getting-to-know-you fare, really, and it marks Outlander continuing the improbable job of balancing Scottish settlers being treated like second-class savages by the ruling class with the maltreatment of the Indians who are natives to the land. Opportunities for missteps are rife, but they haven’t happened yet. 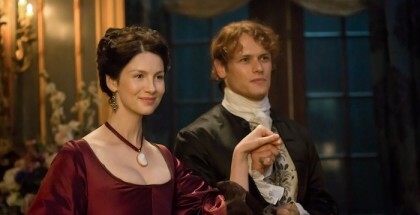 While one side of the show goes from strength to strength in its unity, the other half finds real emotional depth in a separation that feels surprisingly fresh, compared to the more familiar relationship dramas of Claire and Jamie: the separation of Brianna and Roger, after she refused to marry him and he stroppily decided he didn’t want to share a bed with her anymore as a result. They parted ways shortly after, proving that Sophie Skelton and Richard Rankin do emotionally bruised very well. Any bitterness there is offset immediately by the discovery of another old face: Murtagh, who is not only alive in North Carolina, but is doing well – so well that he’s now operating trade as a blacksmith in the town, overcharging Young Ian for some horseshoes and repairs. Duncan Lacroix has always been a joy to watch, whether he’s angry, sad or impossibly jovial – and it’s mostly the latter we get here, as he and Jamie catch up over a pint. That chat gives us some insight into the troubles going down in the town: Jamie’s been trying to recruit residents to live on Fraser’s Ridge and help them build up the estate, but nobody has said yes. That’s not because of superstition about the land, but because of distrust over Governor Tyron and his fiendish taxes – we’re already looking forward to seeing Tryon get his just desserts later this season. Even Murtagh can’t be convinced, which is a sign things are dire. Indeed, Murtagh is something of a troublemaker around these parts, or something of a hero, as he turns out to be leading the general uprising among the locals against Tryon’s tax collectors – a meeting that Jamie and Young Ian attend stirs up some intriguingly prickly tensions, as Jamie has pledged to support Tryon as part of his land agreement, but also knows that to go against Tryon would put him on the wrong side of history. 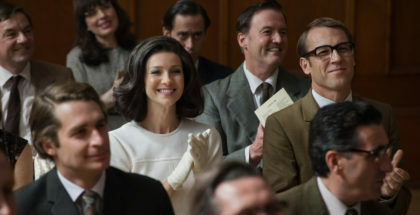 Murtagh isn’t about to break up the BFFs, though, and he does swing by Fraser’s Ridge for a chinwag with Claire, and seeing them singing Boogie Woogie Bugle Boy again is a genuine delight. 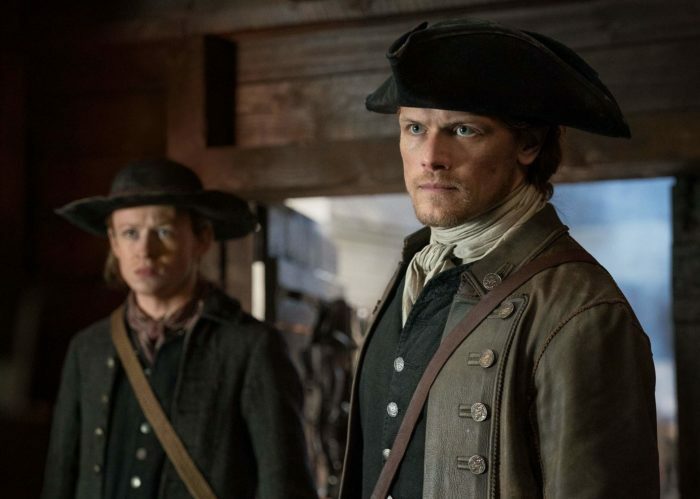 But there are more layers being unfolded back at Fraser’s Ridge, where Claire is getting closer with the Cherokee’s healer, who tells us that Brianna is with them – something that takes on a little extra weight when we hear that Jamie has seen their daughter in a dream, including a birthmark on her neck he knew nothing about. Otherwise, there’s drama with the Mueller family, as Herr and Frau Muelle’s daughter, Petronella, has a daughter of her own, named Clara. But when Herr Mueller sees some Cherokee giving their horses water from his land, Claire finds herself playing peace-keeper too, trying to talk down an armed stand-off between the two clans. Even then, though, the Mueller family (apart from Herr) wind up dying from the measles, which only stokes the raving fears of Herr Mueller that some kind of curse is at play. When he turns up on Claire’s doorstep that night, we worry he’s about to threaten her, but it’s actually to give her a gift – which all seems nice until you realise that his bundle contains the scale of Adawehi. It’s a horrifying moment that the camera doesn’t shy away from, setting the tone for dark things to come in the future. Indeed, the Muellers house is burned down in retaliation. With Roger and Brianna also discovering in the history books that Fraser’s Ridge is eventually destroyed by fire, tragic farewells look to be rearing their head all over the shop. And so a huge round of applause is due to Outlander, which delivers its biggest twist yet by wheeling out an entirely unexpected reunion: Brianna. Roger tries to track her down, only to discover she’s gone to Inverness and, yes, has trekked out of town to find the fabled standing stones. Heading there to travel back to warn her parents of what’s to come, Roger arrives to find the place empty – it looks like this timey-wimey drama just found a new traveller. What a fantastic twist to bring new emotional and chronological complexity to the series; on top of its fresh location and fresh new historical dilemma, Outlander’s fourth season is off to a very promising start. Season 4 of Outlander is available on Amazon Prime Video, as part of £5.99 monthly subscription. New episodes arrive weekly on Mondays, within 24 hours of their US broadcast.